I took the time to read through the article and to read the section of the original report that is referenced. After reading them, the intent of the pie charts was clear. The articles helped me organize my visualisation in a manner that makes the message more clear. I decided to highlight the U.S. with the official red of the U.S. flag. For me, the bar charts are much more clear than the pie charts and they help me break the story into two parts. 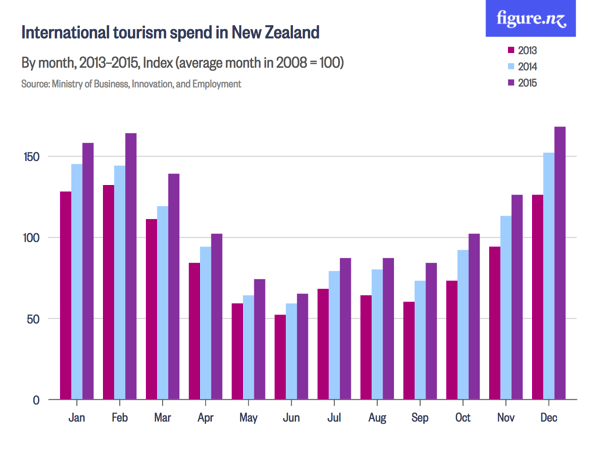 Inspired by the visualisation by Harry Enten that I highlighted today on my sister site DataVizDoneRight, I decide to look at the New Zealand tourism data again and see if I could build a similar view. After all, no data visualisation is ever “complete”. I really like how this turned out (and thank you to Eva Murray for feedback). I incorporated a legend on the upper right to make the bars easier to interpret. Basically the grey bar shows the 25th to 75th percentile of all of the regions and the red dot indicates the median of all regions. I’ve removed the total region from the view. Nice challenge from Emma this week! She’s a massive NFL fan and since the Super Bowl is upon us, she decide to challenge us to create a common baseline chart that shows the passing yards for QBs in the NFL over the course of their careers. Go to her blog for the full challenge details. First requirement was to filter to QBs that had played at least 3 seasons and had at least 2000 total passing yards. I did this by adding a data source filter. The benefit of doing this is that my Player list will now only include those that meet the criteria and I won’t need filters elsewhere. Next, I created a LOD calc to get the first year for each QB. I built upon that calculation with this calculation that gives me the number of seasons played per QB. This goes onto the Columns shelf. The cumulative passing yards is merely a running total table calc set at the Year level. This goes on the Rows shelf. I put Player on the detail shelf to get a line per QB. I also put Year and Yds on the Detail shelf since I need those for the tooltip. Next was a parameter to pick a QB and use that to highlight the QB chosen. 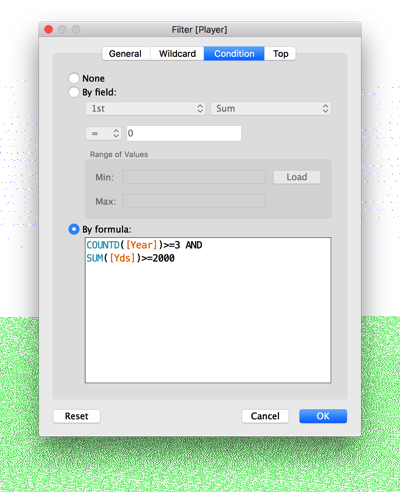 I then created a simple calculation that check the Player again the parameter and put that on the color shelf. Last was the dot on the end of each line. 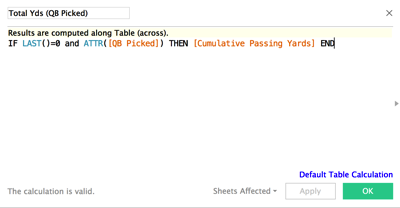 To do that, I created a calculation that checks if it’s the end of the line and the player selected and, if so, return the cumulative passing yards. 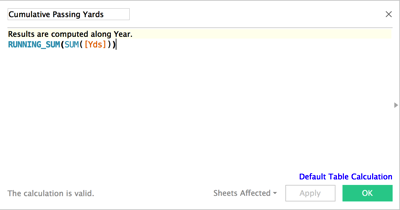 Since this is a nested table calc, it’s important to set both table calcs to compute using Year. Some tidying up, adding the footnotes and I was done. I decided to float all elements on the dashboard to ensure they would render exactly as I wanted them to. Another fun week of learning something new! Thanks Emma!! This week’s Makeover Monday data was too much fun to not continue to play with. I’ve kind of had a crush on barcode charts/strip plots since Makeover Monday week 44 last year when I created a barcode chart of Scotland deprivation. Given how this week’s data needed to be viewed at the month, region, visitor type level in order to represent the index properly, I thought I’d give a barcode chart a try. Why do I think it works well in this case? By color-coding the overall index red, I can clearly see how it compares to all other regions. A barcode chart is great for showing distributions. The reference line at zero let’s me see how many regions are above and below the 2008 average. Having a row for each month allows me to see which months were more above the average than others, particularly within a year. This helps me see the big picture (spending has increased over time) while still giving me all of the details of all regions. What do you think? Does it communicate well for you? Click on the image for the interactive version. There was a region named “Total (all TLAs)” that represented the total but was mixed in with all of the other regions. The data was an index, which is calculated as a weighted number for each region, month, and visitor type. 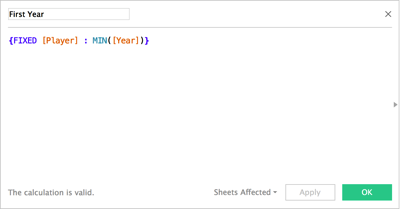 When using indexes in the dataset, using an average aggregation is appropriate as long as you only use it at the individual region, month, and visitor type level. You can’t use an average of the average to represent the total. I saw a few people make the mistake of using an average of the average very early on (I won’t shame them publicly), so I thought it would be appropriate to explain averages of averages, why they don’t calculate “accurately", and how people should be using them. Have Increases in Healthcare Spending Led to an Increase In Life Expectancy in America? I was looking at an article on Visual Capitalist last night and saw another story that caught my eye. It was a connected scatterplot of life expectancy vs. health care expenditure for OECD countries. Everything on it is well documented including the data source. So off I went to get the data for Life Expectancy and Health Care Expenditure from the World Bank. 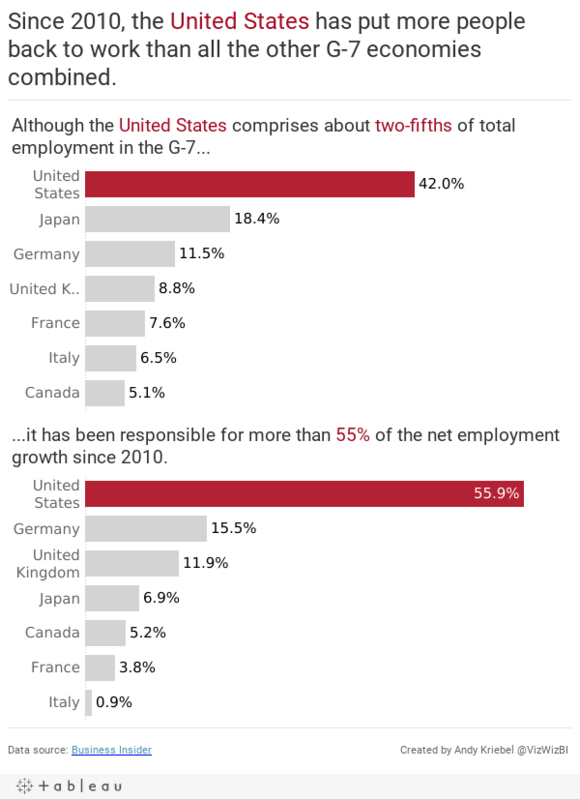 I wanted to rebuild this chart in Tableau. One interesting note is that the original visualisation had data back to 1970, yet that data is nowhere to be found on the World Bank website nor is it documented where it came from. That’s not very good. I limited my re-creation to the data I knew was accurate, 1995-2013. This didn’t take too awfully long to create in Tableau, with most of the time being spent fiddling with the country labels. I know they overlap the lines in a lot of places, but I think it still works. When you click on a line, you’ll see drop lines that reveal the values for that point and also highlight the whole line for that country. As always, rebuilding a chart I like has been a good learning experience. This was the first time I used drop lines and it was fun figuring out how to get only certain points labeled and colouring everything just right. Already four weeks into another fun year of Makeover Monday. As it’s an even numbered week, it’s Eva’s week to pick the topic. I’m really enjoying her helping out with picking topics because it allows me to participate like everyone else. I don’t see anything ahead of time and have to read the article, interpret the data and build a viz all at once. When I pick the topics myself, I tend to think weeks ahead about what I want to create. 100 is the baseline (see the subtitle), so why isn’t the chart the difference from the baseline? Are there more years that could be used for comparison? What was spending like before 2008? How do 2013-15 compare? Are we trying to understand the change within each month or the change across the years? I must admit that I got sucked in by all of the detail Eva provided in the data set. I started by creating a view of the change in spending by year compared to the 2008 average. After all, this is the baseline, so we should be comparing to that. Anything above 100 is an increase compared to 2008; anything below 100 is a decline versus 2008. I wonder how many people are going to catch that subtlety in the data. I understood it after reading the notes that accompanied the chart. This is what I came up with first. It show the change versus 2008 for each region. Click on the image for the interactive version. How did the overall spending change compared to 2008 for each visitor type? What was the change by year within each season? This would help me understand any seasons where tourism spending has decreased. Overall, a really fun data set to play with and a lesson learned to not get sucked into the data too quickly. I need to think more holistically, think about the story I want to tell, search for idea, do some sketching, and move away from Tableau when I start. Basically, practice what I preach. Sasha Pasulka has been a good friend of mine for many years and is moving to London from the US soon in her new role with Tableau. Like anyone else that’s moving to a new country, she finds the entire process is ridiculously overwhelming. Trying to find apartments from thousands of miles away, not knowing anything about neighbourhoods, can be an incredibly daunting task. 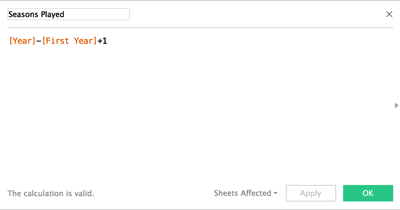 To help her, I decide to build a viz in Tableau. 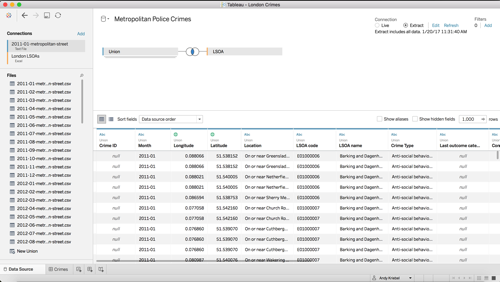 I started by using the London Crimes web data connector from Tableau Junkie, only to realise that it’s somehow not returning all of the data. It looks like it returns the data via a radius versus for an entire postcode. No worries though. Instead I went to data.police.uk and downloaded all crimes from the Metropolitan Police Service. This returned a separate CSV for each month and it also wasn’t limited to just the London area. On the London Datastore I was able to find a list of all LSOAs in the London area. Great! All I needed to do was union all of the CSVs then join them to the London LSOAs. I love that I can do all of this straight inside Tableau now. 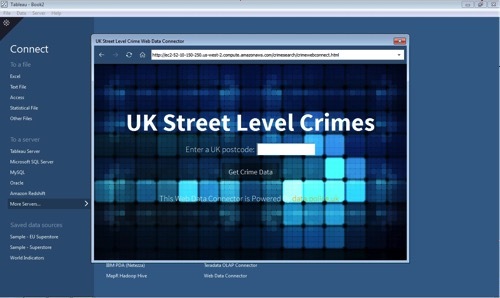 From there, it was a matter of building a simple visualisation that allows Sasha to pick boroughs and see the crimes in those areas. Note that I set the map to only display when there are 3 or fewer boroughs selected. did this because the map was simply too slow to draw the dots. Hopefully she likes it and makes it easier for her to settle in. Last week on my Data Viz Done Right site, I wrote about a great small multiples visualisation created by Matt Stiles that shows U.S. unemployment compared to the national average for every State. I recreated Matt’s work in Tableau, and your challenge for this week is to do the same. Personally, I find trying to rebuild visualisations a great way to learn. My viz is 875x2150. Your’s doesn’t have to be this size, but I thought I’d provide it for guidance. I’m using the Source Sans Pro font, which you can download from Google Fonts. This is the font that Matt used in his version. The years should be displayed every 10 years. The axis line on for the year should be more distinct than the gridlines. The ends of each line should be colour-coded by whether it was an increase or decrease compared to the national average. You will need to calculate the national average. The national average needs to include the District of Columbia, but D.C. should not have its own chart. The national average is the line you see at 0%. This is NOT a trellis chart, but if you think you can make it work as a trellis chart, go for it! The area above zero should be shaded. The hex code to use is #F7E6E2 and it should be shaded from 0- to +10%. Pay attention to the gaps between each State. I like how this gives it some breathing room. This will be a very tedious exercise. To provide some context, this took me 2-3 hours to create. Don’t get discouraged and don’t feel like you have to do it all in one sitting. Basically, try to make yours look identical to mine. Post an image on Twitter when you’re done and hashtag it with #WorkoutWednesday and please tag me so I see it. You can also comment below with a link to your workbook or with any questions you have. Good luck! The bubbles are ordered from largest to smallest from left to right in a Z-pattern making it pretty simple who he tweets the most. Bubble charts are notoriously hard to use for comparison; a simple bar chart would be so much easier to read. The viz lacks insight or a story. The article has some in-depth writing; would have been great to include that in the visualisation. I must admit that I struggled a bit this week. I was trying too many charts and had trouble focusing my story. On top of that, I messed up the TDE that I created for everyone. Note that when you use the DATEPARSE function hh means hour in am/pm (1~12) whilst HH means hour in day (0~23). I had used hh initially which made it look like Trump takes lunch off from Twitter. Makeover Monday: Have Apple Lost Their Edge With iPhone? What does the * mean next to 2016? Is the axis needed if the bars are labeled? For my version, I wanted to focus on the story that was in the article itself. I was particularly struck by the percentage of revenue that the iPhone now accounts for in Apple’s overall revenue. 2017 is here and with it another 52 weeks of Makeover Monday. ICYMI, this year Eva Murray is joining me on the project. We’ll be rotating each week, which I’m looking forward to as it’ll help challenge me more. For week 1, we’re reviewing this article from Women’s Agenda about the massive pay gap that exists in Australia’s 50 highest paying jobs. Interestingly, we’re not making over a chart this week; instead it’s two ordered lists. It’s basically impossible to compare men and women in the same jobs, which was the whole purpose of the article. Within a gender, you have to do the math in your head to compare jobs. A simple bar chart, would make it to compare at a glance. There’s no “story” to the data. What’s the call to action? The lists only show the top 50 for each gender distinctly, making it really hard to find an overlap in the lists. There’s no sense for the “overall” gender pay gap when limiting the list. With these goals in mind, here’s my first Makeover Monday of 2017.